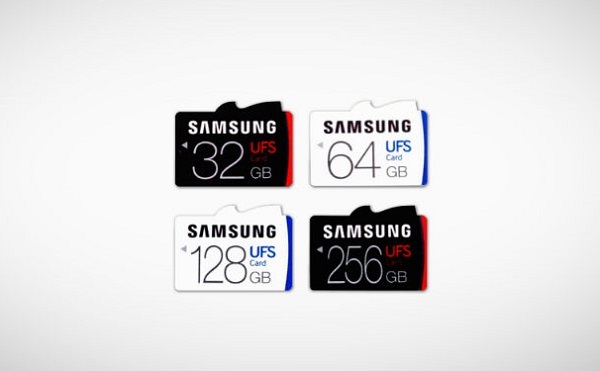 SAMSUNG launches world's first Universal Flash Storage (UFS) removable memory cards. Samsung Electronics today unveiled the industry's first removable memory cards based on the JEDEC Universal Flash Storage (UFS) 1.0 Card Extension Standard, for use in high-resolution mobile shooting devices such as DSLRs, 3D VR cameras, action cams and drones; coming in a wide range of storage capacities including 256, 128, 64 and 32 gigabyte (GB). Samsung's new 256GB UFS removable memory card - simply referred to as the UFS card will provide greatly improved user experiences, especially in high-resolution 3D gaming and high-resolution movie playback. It provides more than five times faster sequential read performance compared to that of a typical microSD card, reading sequentially at 530 megabytes per second (MB/s) which is similar to the sequential read speed of the most widely used SATA SSDs. With this UFS card, consumers have the ability to read a 5GB, Full-HD movie in approximately 10 seconds, compared to a typical UHS-1 microSD card, which would take over 50 seconds with 95MB/s of sequential reading speed. Also, at a random read rate of 40,000 IOPS, the 256GB card delivers more than 20 times higher random read performance compared to a typical microSD, which offers approximately 1,800 IOPS.